Reltech Limited Independent Test Laboratory - Reltech Limited is an independent test laboratory providing Semiconductor Qualification, Life-Test, Burn-In and Reliability testing services. Reltech Limited is an independent test laboratory providing Semiconductor Qualification, Life-Test, Burn-In and Reliability testing services. 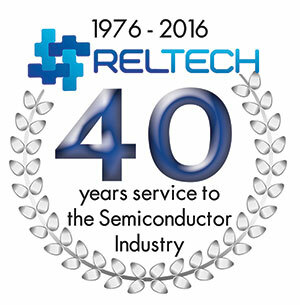 Reltech Limited founded in 1976 is an Independent Test Laboratory, Burn-In and HTOL system manufacturer serving the Semiconductor and Microelectronics industries. Reliability and Qualification test services are provided to industry leading Fabless Semiconductor companies and Integrated Device Manufacturers. Reltech’s vast experience in qualification testing and HTOL system design and manufacture enables it to offer its customers full turn-key solutions covering all aspects of semiconductor reliability, including qualification planning, die and package level testing such as High Temperature Operating Life (HTOL), Highly Accelerated Stress Test (HAST), Low temperature Operating Life (LTOL) and Temperature Humidity Bias (THB). Reltech develops, designs and manufactures all of the required test hardware and software used for the complete qualification testing of its customer’s products prior to volume manufacture. For Board Level Reliability, Reltech provides a full HALT turn-key solution including consultancy, training, product analysis, strategy, HALT and Qualification testing. Copyright © 2019 Reltech Limited is an independent test laboratory providing Semiconductor Qualification, Life-Test, Burn-In and Reliability testing services.